you would come at last to the Snow Garden. Here, safe from the dangers of the icy wilderness, lived little Anya with her mother and father. A haunting, lyrical fairytale, beautifully illustrated by Daniel Egneus. Anya lives with her mother and father in the shadow of the icy glacier where the Snow Witch reigns. Every spring, Anya's mother journeys to the glacier to pick the blue gentian flowers that grow there. But this time, she does not return. She has been captured by the Snow Witch and imprisoned in the ice. Anya and her father set off with the ravens to rescue her. It's a treacherous journey, and there is no knowing what they will find… Will the strength of Anya's love conquer all? 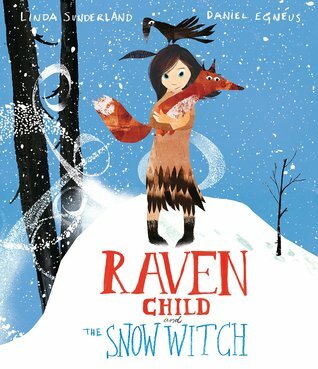 Raven Child and the Snow Witch is a poignant, powerful story with dramatic and striking artwork. Raven Child and the Snow Witch is a picture book for older children – a rare and very welcome thing! I've often wondered why children are denied large, coloured pictures once they reach a certain age, so hooray for Templar for flying in the face of convention! This slightly scary story is told in poetic, descriptive and mystical language. It's set in the far distant, fairytale world of the Snow Garden and, like all fairytales, it has darkness at its heart. Of course we know that Anya will triumph over the Snow Witch, but that doesn't stop us feeling afraid for her when she sets out to rescue her mother. Daniel Egneus's abstract illustrations are perfectly matched to the text and add another element of darkness to the story with their whirling snow storms, spiky buildings and shadowy trees. My only criticism relates to the book's front cover. It glitters so invitingly that I was taken aback by the story inside because there's no hint that it will be scary. The back cover's a different matter though, with a creepy white figure who I guess is the Snow Witch herself. This is a memorable book and one that deserves to be widely read.